Is this a misinterpretation as what our Ministry of Foreign Affairs explained? Or, deep in his heart, should PM Lee see this as a warning to himself or worst still, a slap on his face prior to meeting the new leaders of China. New leaders always come with 3 fires (新官上任三把火). This is the first time that PM Lee meets President Xi Jin-ping and Prime Minister Li Ke-qiang in their respective new capacities. As an outsider, it is not our business to know (details) how Chinese choose their leaders. However, PM Lee’s remark on Diaoyu Islands in Tokyo in May 2013 is a very sensitive issue in China. A wrong remark or misinterpretation can easily lead to strong emotional reaction. It is understandable after the publication of the ‘misinterpreted comment’, strong reactions are expected from netizens in China. It blamed the Global Times and the Global Times said they just carried the same piece of news from Ta Kung Pao. 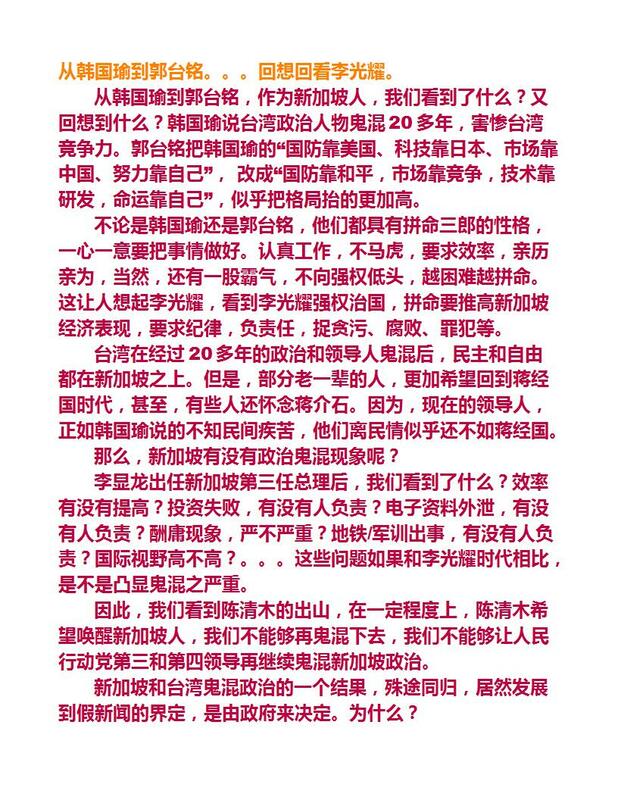 They can blame each other but the timing of the publication looks more like a warning to PM Lee, in Chinese it is 下马威. Before landing in Beijing, let’s warn you over the internet first indirectly and ‘unofficially’. Both Ta Kung Pao and the Global Times are mouthpieces of the Chinese Communist Party. Ta Kung Pao (大公报) is a pro-communist newspaper in Hong Kong #2, so do the Global Times in China #3. Just imagine SINGAPOLITICS #4 publishes some bad news about our neighbours, for example, the haze problem or the crimes happening there. What will the foreign governments and their netizens think? How will they interpret it? Can SINGAPOLITICS claim that they are independent and are just a private identity under Singapore Press Holdings? PM Lee and MFA, of course, can claim that this is just an isolated incidence by non-official news website in China. They can even say these are social media in China, like the (mistrusted) social media in Singapore. Deep in the hearts of Chinese and Singaporeans, do (they and) we really interpret in such a way? Is it just simply a ‘completely out of context and grossly distorted and misreported’ news over internet? Back in Singapore politics, the phrase ‘completely out of context and grossly distorted and misreported’, in fact, looks quite familiar. Can you recall some of the past incidences? It needs no further explanation. If this can be used as a political excuse to do some things, to serve some purposes, why can’t it be used as a warning or even a slap just before the Beijing visit? Besides enjoying his visit in China, PM Lee should think very hard what really his hosts are trying to say? Wrong interpretation or misinterpretation from the Singapore side has to be equally weighted and taken into consideration seriously. Prime Minister Lee Hsien Loong had finally delivered his National Day Rally speech for 2013. He concluded that there was a new way forward and announced that the government was making major strategic changes. You also read about the comments from two different sources: mainstream media and social media. Now, consider this is as a political rally speech in the General Election 2016, will you be persuaded and influenced to vote for Lee and the People’s Action Party (PAP)? Reciprocity, scarcity, authority, consistency, liking and consensus. Reciprocity: People are obliged to give back to others the form of behaviour, gift, or service that they have received first. Lee has made some changes in housing, education, and health care etc. Are you the one who will be benefited from the changes? What will you do in return? Scarcity: Simply put, people want more of those things they can have less of. Authority: The idea that people follow the lead of credible, knowledgeable experts. Lee announced big projects like new airport terminal, new port in Tuas, the moving of Paya Lebar Airbase, etc. They are experts in economic development. Consistency: People like to be consistent with the things they have previously said or done. Lee said Singapore was making a shift and a major one. But at the same thing, he said, ‘we may have made major shifts in our policies, but our core purpose has not changed.’ He wants changes but also wants consistency. Liking: People prefer to say yes to those that they like. During the speech, Lee was seen moving to tears. Do you like it or not? Overall, do you like his speech? This ‘liking’ factor needs further explanation. In the video, it mentions: We like people who are similar to us, we like people who pay us compliments, and we like people who cooperate with us towards mutual goals. Similarity, compliments and mutual goals, have you found these in Lee’s speech? Consensus: Especially when they are uncertain, people will look to the actions and behaviours of others to determine their own. Lee said his speech was a feedback of Our Singapore Conversation that seeks consensus for the future development of Singapore. Do you agree with this consensus? Do you see the consensus? After viewing the video, you can then use the 6 short-cuts to make you own judgement. If the election is called tomorrow, will you vote for Lee and the PAP? Which one of the short-cuts is the most critical factor for you to make your decision? And are you a marginal voter and will you make a change after listening to his speech? Voting is secret and we should all make a wise choice for Singapore. There is rumour in social media, if Lee’s sales technique and persuasion work, the PAP will call for early election. Li Ka-Shing is the richest Chinese in the world and of course in Hong Kong, his business is almost everywhere ranging from logistic, supermarkets, energy, to property development. Interestingly, a recent article from the influential 21st Century Business Herald#1 in China predicted that his monopoly or golden era in Hong Kong is over. Li’s position in Hong Kong in many ways is even more important than Temasek Holdings in Singapore. Why a mighty ‘Superman’ has to end his golden era in Hong Kong, 17 years after the return of HK? The reason is simply. According to the article, Chinese state-owned enterprises (SOEs) are marching into Hong Kong. In the eyes of Chinese political leaders, the most they can classify Li is just a successful businessman and for political reasons, the importance and existence of SOEs in Hong Kong are more than doing businesses and making money alone. So, Li now moves his investment to Europe. Why does he want to move to Europe when Li has so good connection in China? And Euro crisis and European recession are still not over yet. Perhaps, he sees the value in Europe or the undervalued assets in Europe as The Malay Mail above had suggested. The 21 Century Business Herald gives another reason. Li predicts his future business development in Hong Kong is limited and his monopoly positions in many business sectors are ending. However, the decisive reason is he sees his investment in Europe has a stable and predictable future with certainty. In another word, he wants to invest in a business environment that has legal protection. We have to understand that media in China is controlled. Why does a Chinese publication make such a prediction? Why does Li think there are less legal protections in Hong Kong in future? And the 21st Century even says Li has made a right business decision and strategic move. At least, we are lucky Singapore is an independent sovereign country and Singaporeans can decide our future in the present moment. Legal protection is always here and increasingly, the ruling party has to respect the rights of citizens. But will the Hong Kong situation happen to us? When our population increases to 7 million, the game play will be very different. We have seen more and more SOEs coming to Singapore as well as many Indian companies too. In theory, we can do a yin-yang balance to offset all the inflows of Western, Japanese, Chinese, Indian and Korean investments and businesses. Just like what we did in the past 50 years. But with the increasing mistrust between the PAP and Singaporeans, what will be the future look like? Will the PAP be another Chief Executive of Hong Kong, having limited say in the running of Singapore? Will Temasek Holdings like another Li Ka-Shing, having less control over Singapore economy? Perhaps, a less monopoly Temasek in Singapore is a good thing to all. We don’t know. The Wall Street Journal Chinese edition has an interesting article on political promise in China#3. Singapore’s situation today is certainly better than that of today’s China. Yes. The PAP won the elections in the 1960s with the people’s support. They now control the machineries of the country. But when we awake and demand for more changes, they hesitate and refuse to adjust. Under Singapore Constitutions, general elections have to be held regularly, this makes us very differently from China and Hong Kong. We decide the political stability and legal protection in Singapore. We still have a final say at least in the coming election. We should appreciate it and vote wisely. One Man’s View, Can Lee Hsien Loong handle it? A new book entitled "One Man's View of the World" was recently published by PM Lee’s father. The book conveys senior Lee's views on foreign affairs, international politics and the future of major powers and regions of the world. Looking at the possible future as described by his father, can PM Lee and his PAP team handle the situation well? Do we have the confidence that the PAP can face the future? If not, PM Lee may claim that the one man’s view is just another Chinese Room Argument. The PM, who is unable to solve the future problems in one man’s view, can just simply claim that the view is just another artificial intelligence. So, the PAP is in dilemma either to face an unsolvable future or to deny the artificial intelligence of Lee Kuan Yew. In reality, the possible likelihood of the future may be something in between, some true and some not true, some will happen and some will not. The best defence for the PAP is if the PAP cannot move among the big ‘trees’ smoothly, then the inexperienced oppositions will find it even more difficult to do the same. True or not true and who is inside the ‘Chinese Room’? Is it the PAP or the people? In order to manoeuvre among the big countries, as highlighted by Heng Swee Keat, you need the support and trust of the people. Experience or inexperience, Singaporeans cannot totally base on artificial intelligence prediction of the future. They have to decide who is best representing their interest. Who can help to solve the following problems? Lee said the falling fertility rate remained Singapore's biggest survival threat. And there are many more other problems and situations. After watching his national day message, do you think Lee Hsien Loong is able to handle the situation inside ‘One Man’s View’? The book is talking about future scenarios and challenges, PM Lee got the first hand information directly from his father, how is he going to digest and face it? How would he distinguish the illusions of China Room argument? Comparing China’s Xi Jing Ping to South Africa’s Nelson Mandela and saying one-man-one-vote is unimaginable in China, which is a China Room argument? Can PM Lee handle and face it well? In his senior years and seeking a quick exit in life, senior Lee is now more like a ‘consumer item’ rather than giving insight views of the world. Singaporeans should provide him a ‘peace of mind’ environment rather than continuing seeking China Room foresights?